Jean Young (1914-1995) was born in London where she studied at the Farnham School of Art under Otway McCanell. Then for two years she was at the Regent Street Polytechnic School of Art with Stuart Tresilian, and in 1933-38 at Royal Academy Schools (her teachers including Walter Russell, Tom Monnington and FE Jackson). She was a medallist for composition at the Schools in 1938. Young was a member of RBA and NEAC. She held a series of solo shows in London, Canterbury and Bath; mixed show appearances including RA, LG and SWLA. 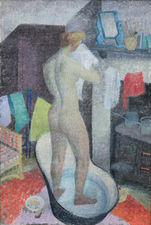 Hereford City Museum and Art Gallery hold examples of her work.